Here it is! My card for my application. The rules for this Supply Challenge were as follows: Brads, Designer paper, Ribbon, 1 stamp set for images and sentiment or one stamp set and computer generated sentiment. Other suggestions: keep other embellishments to a minimum, use CD stamps of course. I have been wanting Clear Dollar Stamps for ages; I have several sets on my wish list. I sadly have not gotten the $ for them yet. **SIGH** So I hope they will forgive me and notice my entry anyway. TO THE JUDGES: I don’t know if you have time to read anyone’s text in their posts. But just in case you read this, I will really work hard to fulfill all responsibilities involved in being your Guest Designer. Please see the rest of my blog or my SCS gallery (no fancy user name, just Rebecca Ednie). Thank you. Ink: Memento brown, celery, pretty in pink-SU! Accessories: ribbon-May Arts, brads-Basic Grey, Copic markers, pearl-SU! 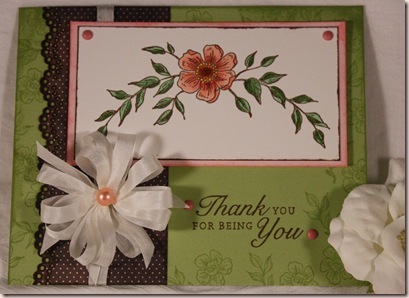 Congrats, Rebecca…I am sooo glad you were chosen for the Guest Designer spot for June…your work is awesome and I can't wait to see what you do with the wonderful CDS's!!!! Congratulations on your guest designer spot!! You'll have so much fun – and your entry is gorgeous!! Congratulations! you were one of 2 Guest Designers chosen for June and Lori is having trouble emailing you, you need to respond to her soon! Have fun! Congratulations Rebecca on being one of the Guest Designers for this month. I just love your card. Welcome to the team for this month. You’ll love it. Everyone is sooooo nice to work with. Congratulations.. I can’t wait to share this month with you as Guest Designer..
Beautiful! WOnderful use of brads and ribbon and such pretty coloring!